Home to 54,000 students, the University of British Columbia (UBC) encompasses campuses located in Vancouver and the Okanagan Valley. It also includes a center for continuing education and affiliated teaching hospitals situated throughout the province of British Columbia. 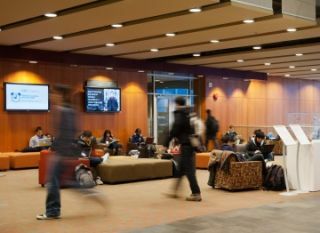 To reach its entire population of students, staff, faculty, and visitors across its varied locations, UBC needed a digital signage solution that would enable instant communications via multiple screens. Since the university does not allow third-party advertising on its network, UBC required a solution that was both cost effective and easy to use in order to keep its operating expenses at a minimum. The solution had to allow UBC’s communications and marketing departments to promote their branding efforts, give student groups the opportunity to share their events and programs with the rest of the student population, and make possible the ability to broadcast emergency alerts across all displays. In addition, business units such as Food Services wanted to utilize the solution to expand and improve on existing signage, while UBC’s faculties and schools — such as the Faculty of Education and the Faculty of Arts — were looking into the possibility of adopting this new technology to increase awareness for their activities and events throughout the multisite institution. After an initial pilot period, UBC selected Haivision’s CoolSign digital signage solution for their “Campus Signage Unlimited” program. With 99.99 percent uptime, the solution provides a stable, centrally controlled communications platform for distributing emergency messaging to multiple sites via digital screens. It is also fully scalable and managed by a flexible licensing agreement, which allows for cost-effective operation and simple expansion of the network whenever required. To promote the UBC brand, the solution enables a campus-wide content playlist that is centrally managed. Local units can either subscribe to this playlist or use individual pieces of content they feel would be appropriate for their audience. Recent campus-wide rotations include notices for Remembrance Day ceremonies, teaser profiles of student athletes partaking in the 2012 London Olympics, and student film projects posted to the university’s large outdoor display. UBC has also integrated social media updates to promote special events unfolding live within the campus. Individuals such as students can also submit content to their local signage administrator for rotation in either the campus-wide content playlist or for consideration on the outdoor display. This combination of centralized and de-centralized content gives individual units the autonomy to approach digital signage in a way that fits their existing workflows but still provides a centrally managed infrastructure and support. It also allows the university to grow its own capacity for creating great content that will meet the needs of its community. Using CoolSign, UBC Food Services is also displaying instant information. By connecting dynamic menu boards to its point-of-sales system, the unit can make immediate changes to its offerings and pricing, enabling better service to its customers.